"This is a work based on the myth of the above mentioned infamous dinner which Tantalus served to the Gods his own son Pelopas as part of the meal...his crime, the passion, the distorted love and all those things that made Greeks...you know...Greeks! Full of imagination, surprises, gruesome attitude, insanity and most of all fun. Elements of my own personal musical language are present which incorporate agitated rhythms, virtuosic writing for the guitars, passion for life and...death of course, memorable melodies, a small reminiscence of a style that a guitar audience will love...(Spanish guitar, counterpoint, and even an optional tambourine part). 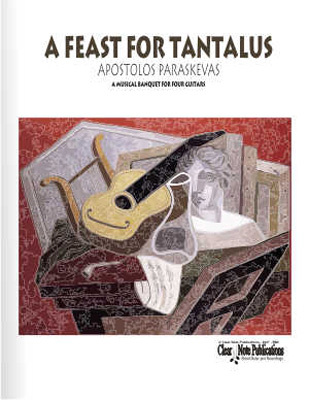 This particular work was commissioned by the Tantalus Guitar Quartet and I truly believe that always a feast after every performance will follow."